Liberal turned to spiritualism, which was a surprise for some of the freethoughters, but I imagine a fair number were previously inclined. O. E. Harmon writes of an incident in which a fire in a medium’s house revealed trickery by Dr. J. B. Bouton, a medium and resident of Liberal, who had been aided by Mr. W. S. Van Camp and Mr. J. H. Roberts acting as spirits. My grandfather talked about how my grandmother’s grandfather, James Allen Noyes, was a spiritualist and injured by the deception. 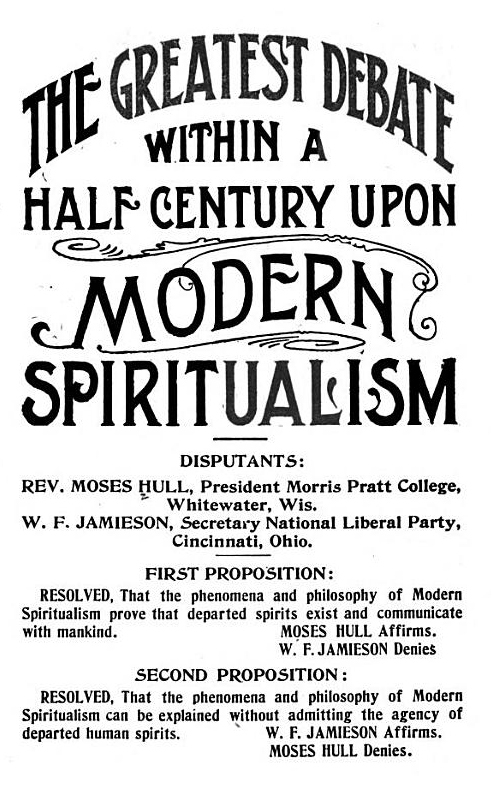 I was interested to find the below account of it in a published debate on spiritualism between the friends Moses Hull and William F. Jamieson. The account is a little confusing but Mr. S. C. Thayer (Salon Thayer) is given as “the landlord” who proposed at least one of the seances, and his wife was one of the spirits who supposedly appeared, she having died in a room of the hotel they ran, after which that room felt by every “hired girl in the hotel” to be haunted “ever after”. A Mrs. Weems is also mentioned. Thayer’s hotel was the National Hotel at Liberal. He was one among the four who stood up in defense of the free love proponents in the town in 1886, or at least he was against the acrimony that had come to be directed against them. One of the original freethought settlers of the town, he left, perhaps in the late 1880s. I’ve been unable to date to confirm who might Salon Thayer may have been in any census and thus find out more about him. Rev. Moses Hull given here as a great biblical scholar and the ablest debater in the ranks of materialism. Whitewater, Wis. W. F. JAMIESON, Secretary National Liberal Party, Cincinnati, Ohio. FIRST PROPOSITION: RESOLVED, That the phenomena and philosophy of Modern Spiritualism prove that departed spirits exist and communicate with mankind. MOSES HULL Affirms. SECOND PROPOSITION: RESOLVED, That the phenomena and philosophy of Modern Spiritualism can be explained without admitting the agency of departed human spirits. * W. F. JAMIESON Affirms. THE PROGRESSIVE THINKER PUBLISHING HOUSE. If living human beings have “spectres,” very much like the apparitions of dead persons, who can distinguish the difference? May they not all be from earthly bodies? But I will reserve further remark concerning Dr. Coues; and, to illustrate a whole class, will now give you an account of a wonderful medium who lived in Liberal, Missouri, Dr. J. B. Bouton. In 1885 he began to hold circles with a few of his neighbor?, some of whom were Spiritualists. A little pine table tipped in answer to questions, three tips meaning “yes;” two, “I don’t know;” one, “no.” Names and messages were spelled out by going over the alphabet. Says Dr. Bouton, “I would often ask them if they really believed it to be the work of spirits. The answer would be ‘Yes, it must be spirits. If it is not spirits, what is it? There is intelligence, and it cannot be accounted for in any other way.” Half the number of investigators at those circles were Materialists when the investigations began and became firm believers in Spiritualism through the mediumship of Dr. Bouton. An old Indian came from the “Happy Hunting Ground,” calling for whiskey and tobacco. Dr. Bouton said he knew an old Snake Indian in Montana who was drunk when he was killed. News of the wonderful manifestations spread through the town and surrounding country like wildfire. Three soft, yet distinct, raps were heard. A former landlady was supposed to be the spirit that rapped. She promised to materialize. A small bed-room adjoining the parlor was used for the cabinet. Dr. Bouton was requested to enter the bed-room cabinet. He did not know what to do. He had never been a materializing medium. The light was turned down, as usual, to give a benighted world more light. The most wonderful sight was that landlady’s spirit. Some could see her features plainly; one of the party saw that she wore the same dress she had before she died, and even the pleats of the dress. This seance created greater excitement than ever. The hired girls of the hotel were alarmed and could never be induced to go to that room unattended. In about five minutes raps were heard, plainly heard by all in the room. In a moment there prevailed a deathlike silence. Writing on a slate under such strict conditions would eclipse anything in that line ever known in the history of the world. The door was unlocked, the slate was taken from the shelf, and, to the unutterable surprise of all present, there was a message covering nearly one side of the slate, addressed to one of the party who readily recognized the perfect handwriting of a dead relative. Such a time of rejoicing was never witnessed outside of a happy Methodist revival. It gave, that message did, a brief description of their beautiful home in the Summerland, a more glorious climate than California. Some of the company would have been willing to sell out and go at once. Three or four times messages were written on slates on that memorable night. The slates were carefully wrapped up, afterwards covered with glass and hung in parlors where friends could see them; but the unbelieving world outside doubted. They were invited to make a close examination of the closet, but found no possible chance for deception. Was there ever a materializing seance-room more critically investigated? Next day Dr. Bouton’s house was crowded from morning until night. Committees of Materialists came to examine the house for some trap, trick or machinery by which the writing was done, but could find no chance for fraud or deception. Have any mediums been more closely tested than this man? Greater works were being done at Liberal than ever occurred in Bethlehem, according to the Spiritualists. The excitement brought many Spiritualists to Liberal. Spiritualism had triumphed over every opposition. Believers and unbelievers came from all parts of the country. Spies were lying around Dr. Bouton’s house whenever it was known that the seances were to be held, watching to catch some one going in or coming out. All of the old Spiritualists who went to Dr. Bouton’s circles said they had attended the seances of some of the best mediums in the world, and they had never seen anything as satisfactory as that obtained through Dr. Bouton’s mediumship. There were nearly a score of as good mediums in Liberal as could be found anywhere, and their spirit controls said Dr. Bouton was as good a medium as the best, and that the manifestations at his home were really genuine spirit manifestations. The mediums would often become entranced, and their “spirit controls” said still greater manifestations were going to take place in Liberal. This was the reason those poor spirits were so thin. Spiritualists are great on philosophizing, and it does not matter with them whether or not they have facts to fit their philosophy. They philosophize any way. Another thing was noticeable. Those thin spirits never talked. Would that not be purgatory? ‘Women, don’t you go! Heaven knows what will become of me when I become a spirit. But the thin spirits answered questions by bowing their thin heads. Another nod from the spirit. A more highly endorsed medium probably never lived than Dr. Bouton, endorsed by old Spiritualists, good judges of phenomena; endorsed by the “spirits” through other mediums. What I have related of him is true of scores of test and materializing mediums—endorsed by Spiritualists and “spirits” as long as they practice mediumship; condemned as frauds, counterfeits, when detected, or self-confessed. Even then many believers insist that they are genuine mediums. This is not a question of the sincerity of mediums. It does not follow that because a medium believes he is inspired that his sincerity proves he is. Do messages really come from a spirit world? That is the point. You claim you have phenomena to prove it. What are the phenomena of Spiritualism? Second. Table movings, or the movements of ponderable bodies in general. Third. Trance and inspirational speaking. Fourth. Clairvoyance, or clear seeing. Sixth. Sealed letters answered by the spirits of departed human beings. Seventh. Materializing mediums of all grades, classes and conditions. All these classes include many subdivisions, such as cabinet manifestations, paraffine molds, planchette, dark circles, bell-ringing, automatic writing, etc. In this cumbersome, indirect, roundabout way, it is confidently believed by Spiritualists that the inhabitants of the spirit world, who once lived in human bodies, communicate with the people of this world. In what does Spiritualism fail? In this: It appears to be impossible for men and women after death to communicate directly, face to face, with the people here, as was their former habit; but interpose a medium, and it is easy. The theory of mediumship is the open door which admits the long procession of trickery. Why should a human being, a medium, be needed? Why should not the intelligent beings of another world converse as easily and directly to the people of this world as we talk and dispute with each other, if Spiritualism were true? If you have not investigated, the Spiritualists everywhere declare you incompetent to render an opinion, however great your scholarship. We admit they are right about this. If you do investigate; and, especially, if in your earlier investigations you were thoroughly convinced that the phenomena do proceed from spirits; but afterwards, upon a more critical investigation, you conclude that the phenomena proceed from human beings, then the stereotyped cry of the Spiritualists is, you are not sincere. They are all big chiefs. I have always heard that the only good Indian is a dead Indian. Surely, no human mind, no earthly being, could originate that, and thousands of similar “communications.” How could any one doubt that it was direct from “Big Moon?” No medium has the capacity to produce such a revelation! From what I can learn, more than a hundred mediums grabbed for “Big Moon;” he was such a delightful savage, and the hundred could be controlled by “Big Moon” all at once. This did not weaken spiritual faith. It strengthened it. A squaw would be quite likely to use the word “regards,” and make the nice distinction between “love” to squaws and “regards” to chiefs. It appears to be easy enough to converse fluently, but not convincingly, over all the United States; and, we are told, as they are “children of nature,” it is quite natural they should. Their earthly reticence has vanished and their revengeful spirit blossomed into heavenly forgiveness for all the cruel wrongs inflicted upon them by the white man. Ladies, Gentlemen:—In this address I will give the sequel of the Bouton manifestations, and then reply to my friend’s arguments. In the lapse of 3,000 years there has been no improvement in the spiritual seance; but there is an endorsement of Dr. Bouton such as the ancient medium did not have, an endorsement by fellow-citizens. “We, the undersigned citizens of Liberal, Barton County, Missouri, have a personal acquaintance with Dr. J. B. Bouton, and know him to be a man of truth and a worthy citizen. We have been given the privilege of examining the conditions under which certain slate-writing takes place in said Dr. Bouton’s house, alleged to be through the instrumentality of spirits. We have availed ourselves of said privilege, and have made a thorough examination of said premises, and we hereby pronounce it utterly impossible that said writing can occur through visitable or tangible human agency. Subscribed and sworn to before me, a notary public, in and for the country of Barton, state of Missouri, this 5th day of June, 1885. F. L. YALE, Notary Public. No Medium ever had a stronger endorsement than that. Now, they were sure, like other Spiritualists, that they could tell the difference between the genuine and counterfeit. This is an unfortunate expression for Spiritualism, because it is a confession that counterfeit phenomena, as they say, are so near like genuine that it is difficult, if not impossible, to tell the difference. Yet upon that difference depends the whole “philosophy” of Spiritualism! In the fall of 1884 the Spiritualists of Liberal, Missouri, induced a medium by the name of Search to visit Liberal, to open the eyes of unbelievers and cause them to believe in spirit phenomena. He was said to be one of the best writing and materializing mediums in the world. 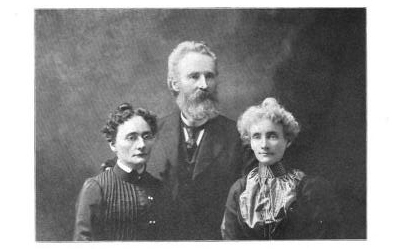 Dr. Bouton, the hero of our story, went the second night because the Spiritualists pronounced the manifestations genuine, grand, wonderful and convincing. A few skeptics besides himself became inspired. The Spiritualists proposed to have circles at Dr. Bouton’s own house to convince him and the other unbelievers. Every Tuesday night they sat and for a few weeks obtained little evidence. The table would shake a little, that was all; but wonders were in store for them. The old Snake Indian shook the table violently, as a powerful savage would be expected to do. He was always tobacco hungry. Some one asked if he would have some tobacco. He said, “Yes.” A good-sized piece was put on the slate, the light turned down low. so as to make “conditions” favorable for dead Indians to chew tobacco. The raps were given, the light turned up and the tobacco was gone! Dr. Bouton became so rapidly developed that he laid the slate on his own knee, took the tobacco off and put it in his own mouth, a gross deception under cover of darkness, and an imposition on an Indian chief living on the other side of the River Styx. Dr. Bouton had his seat in the improvised cabinet. The light was turned down, making the room as dim as “spirits” like it. Dr. Bouton sat with his side to the circle, threw his arm out, raised his hand above his head and brought it forward to the door, when one of the party exclaimed, “Oh, there she is!” It remained but a moment and disappeared. All thought it the most wonderful sight they ever saw, and believed it to be the spirit of the deceased landlady. It came and disappeared several times. The medium then took a white handkerchief in his hand and brought it forward. They could then see every feature plain. That is the time they saw even the pleats in the landlady’s dress, the same dress she wore before she died! To every hired girl in the hotel that room was haunted ever after. At first there was no way to guard against the possibility of discovery. But between the dining-room arid kitchen was a board partition which was once the gable end of the house before the kitchen was built to it. Below the ceiling it was lathed and plastered. Near the partition, overhead in the kitchen, was a scuttle-hole, a snugfitting little door was arranged, through which a man could pass to the top of the closet, and when his work was done he could fasten the trap-door from above so that it would be impossible for any curious person to raise it from below. The way Dr. Bouton came to use that closet for slate writing was because those who were not dyed-in-the-wool Spiritualists were not always satisfied that the spirits did the writing when he held the slate under the table. This is the way the renowned Dr. Slade obtained his slate-writing. Slade and myself were boys in the same town, Albion, Michigan. At one time I believed in his mediumship fully. Dr. Bouton could get no more slate-writing when he held the slate. It seemed as if the spirits were offended on account of the skepticism. The writings on the slates took place in the closet after that, with Dr. Bouton left in disgrace outside. But there was the fraud, there was the trickery, there was the deception. What can it be in thousands of seances where you are not permitted to pry; where, after you are invited to “investigate,” you are expected to take what comes on trust?—and you Spiritualists sneer at the confiding faith of the Christian! All such lessons as the Dr. Bouton development seem lost on a certain class of Spiritualists; and while they fiercely denounce him as a fraud not to be believed, under any circumstances, they fail to perceive that there are many more of his kind in good standing, who go on materializing, with no better material than Bouton had, and not as rigidly tested as he was. Another still more important feature they overlook, and that is their own credulity, the ease with which they are imposed upon in the name of Spiritualism. The journals devoted to the advocacy of spirit communications teem with exposures of mediums; many frauds have been denounced by them, and the public warned. They deserve credit for this. Mr. Jamieson spends almost half of his ninth and tenth speeches in telling you of the tricks of Dr. Bouton, and of his imposing upon a few Spiritualists of Liberal, Mo. Yes, Dr. Bouton took them in; he was a citizen of Liberal and was supposed to be an honest man; and I will not, cannot say that he was not. He was exposed by Spiritualists, and his expose was first published in a Spiritualist paper. His exposition was, that he was going to carry his seance business to a certain point, in order to see how many he could deceive, and then he was going to come out and show how it was done, and thus he would put an end to that kind of mediumship. His house caught fire too soon, and thus he was exposed. The very confidence his neighbors had in him as an honest man caused the people to believe in him. The first one to give me the light on the subject was Solon C. Thayer, a thorough Spiritualist and an honest man. If the man was justified in practicing fraud with the design of by-and-by exposing himself, and claiming that when he had exposed himself he had exposed Spiritualism, then perhaps his neighbors were justified in giving him a certificate of good, moral character. A part of his trick was to get this certificate. Honest men who never do such tricks are not likely to suspect them in others. Thus he roped Spiritualists in. Mr. Jamieson refers again to Dr. Bouton’s tricks. This is a clear case of failing to comply with Paul’s and John’s advice. 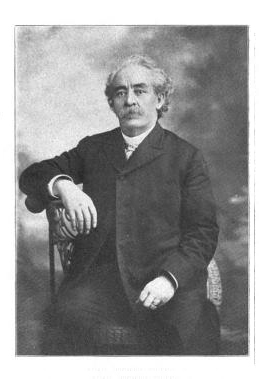 Dr. Bouton deceived several Spiritualists. He had lived in Liberal, where this occurred, some time. He was well known—known to be an honest man. This caused many of his neighbors to believe in him. I do not know but that he tells the truth when he says he never intended to permanently deceive the people. It was his intention to trick the Spiritualists of Liberal for a short time, as he claimed that a man by the name of Search had done, and then come out and expose his manifestations. The fire got the start of him and exposed him first. As for the man Search, of whom Mr. Jamieson speaks, I never for one moment believed in him. He wanted to come to Maquoketa, Iowa, where I lived. I wrote him, “Yes, come on if you are prepared to keep sober and to do your work under test conditions; not otherwise.” He did not come; I know not why. Mr. Jamieson must remember that at this time very few of the Spiritualists had made the discovery that a horde of charlatans had forced their way into our ranks as mediums, and therefore were not looking for frauds as they are now. Hence frauds were reaping golden harvests. I have been denounced many times by honest but verdant Spiritualists, as the enemy of mediums. I discovered two arrant knaves playing medium on this camp ground in 1882 and sent an article to the Spiritual Offering exposing them. It is needless to say that my article was not allowed to see daylight.